Planet Waves RESTORE is a deep cleaning polish cream. 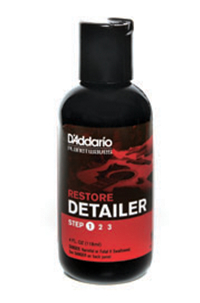 Restore's rich formula is designed to cut through the toughest grime. Safe on all common guitar finishes. RESTORE polishes out swirl marks and even minor scratches, reanimating your finish like never before. For best results, follow with Planet Waves PROTECT pure liquid Carnauba wax.